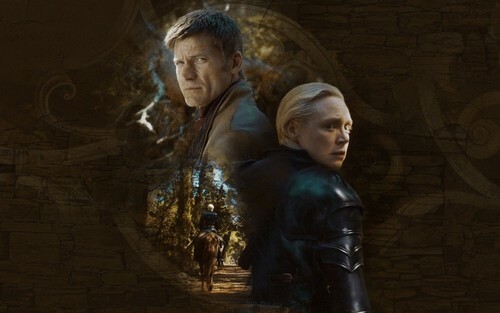 Jaime Lannister & Brienne of Tarth. . HD Wallpaper and background images in the Game of Thrones club tagged: game of thrones season 4 jaime lannister brienne of tarth gwendoline christie nikolaj coster-waldau. This Game of Thrones wallpaper might contain mitaani, mji eneo la tukio, mijini mazingira, jiji eneo, mijini kuweka, kiti cha enzi, and portcullis.